Last week, the Government’s Airports Commission published its Final Report with recommendations on future UK airport capacity, which made headline news. It is leading to renewed debate about aviation growth and its impact on people’s lives, the economy and the environment. There are many links between aviation and meteorology. Air traffic routes across the Atlantic are guided by upper tropospheric winds, either looking for the push of the jet stream when heading east, or avoiding it when going west; and the avoidance of weather hazards (and other hazards, such as volcanic dust clouds) requires active collaboration between meteorologists, air traffic control and pilots. Since the 1960s, aviation’s contribution to climate change has been an increasingly active topic. And this comes almost full circle, as there is also the question of whether climate change itself might impact on aviation, for example via changes in the frequency of turbulence or by changing routes as a result of the changes in the strength and position of the jet stream. I have just returned from a major conference in this area – the 4th International Conference on Transport, Atmosphere and Climate (TAC-4). A backdrop to such meetings are the many aspirational statements by governments and industry striving to allow the aviation sector to grow, while at the same time restraining its environmental impact. For example, the UK Government aims to reduce aviation emissions to 2005 levels by 2050 (this aim was high in the Airports Commission’s deliberations), in spite of demand which, if unconstrained, might see a tripling of passenger numbers. There are many possible contributors to achieving such aims (for example, via improvements to aircraft and engine technology, by dampening demand via taxation, and by using alternative modes of transport (and non-transport!)) but there are several that require increased understanding of the atmosphere, if we are to guide stakeholders in the aviation industry. 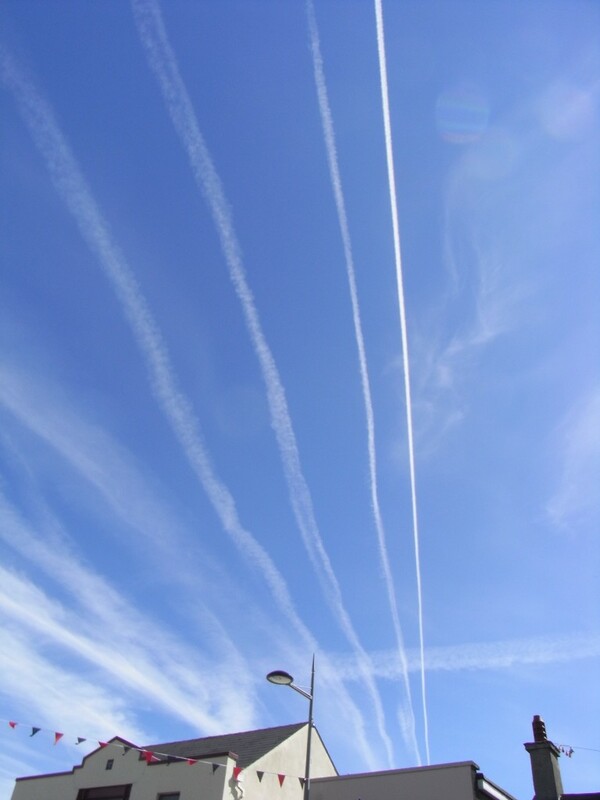 CO2 emissions by aviation are one of its major contributors to climate change, but more challenging are the so-called non-CO2 climate effects – these include contrail formation and the effect of emissions of oxides of nitrogen by jet engines on ozone concentrations. The non-CO2 effects could double the impact of aviation on climate (strictly, the radiative forcing due to present-day aviation) compared to the CO2 only case, although for some of the non-CO2 effects, uncertainties are substantial. One live topic at TAC-4 was the use of aviation biofuels – since these avoid the use of fossil fuels, they could contribute to the solution, but (amongst many other issues) we need to be sure that non-CO2 effects do not nullify these gains. Biofuels lead to the emission of fewer soot particles than conventional aviation fuel, which may ultimately lead to contrails with a smaller climate effect. To be sure of this requires detailed observations of engine emissions, both on the ground and at cruise altitudes (a real challenge!) as well as detailed numerical modelling. Another live area is the potential for so-called climate-friendly routing, which take into account non-CO2 as well as CO2 effects. It may be years before such routing becomes a practical possibility; at the moment we are taking “baby steps” to understand the issues (not only for climate but for the airlines and air traffic management). One central issue is how we can compare the climate effect of a short-lived (i.e. hours) contrail with CO2 emissions, some of which perturbs atmospheric concentrations for centuries to gauge whether it is sensible to take a longer route to avoid contrail formation. This kind of work may sound very practical – but given the gaps in our knowledge of atmospheric processes in the upper troposphere and lower stratosphere, it is also challenging. I always like to remember that during the Second World War, a famous name in meteorology, Alan Brewer, was asked to understand why RAF aircraft were unexpectedly causing long-lived contrails. The instruments he developed to do this led him, after the war, to discover the extraordinary dryness of the stratosphere. This played a key role in developing understanding of the nature of the stratospheric circulation and, in particular, in proposing the Brewer-Dobson circulation which now plays such a central role in stratospheric thinking. This entry was posted in aviation, Climate, Climate change, Conferences, Weather forecasting and tagged aviation, climate effects, contrails, Heathrow third runway. Bookmark the permalink.